We write on behalf of Lawyers’ Rights Watch Canada (LRWC), a committee of lawyers and others who promote human rights and the rule of law internationally. LRWC also campaigns for lawyers and other human rights defenders in danger because of their advocacy. Lawyers’ Rights Watch Canada is alarmed by the assassination on 3 March 2016 of indigenous environmental and human rights defender Ms. Berta Cáceres. She was tragically murdered in spite of precautionary measures granted in 2009 by the Inter-American Commission on Human Rights (IACHR) and the 2015 Law for the Protection of Human Rights Defenders, Journalists, Social Communicators and Legal Practitioners’, Decree No 34-2015 (Protection Law) confirming the duty to protect human rights defenders. LRWC is also deeply troubled by the continuing danger to the lives and security of the sole witness to the murder, Mr. Gustavo Castro Soto, and of members of Ms. Cáceres’ family and the Consejo Civico de Organizaciones Populares e Indigenas de Honduras (COPINH), an organization co-founded by Ms. Cáceres. Also disturbing are reports that police subjected Gustavo Castro Soto to ill-treatment after the murder. While Honduran authorities have stated a commitment to finding those responsible for Ms. Cáceres’ murder, police have so far failed to focus their investigation on persons responsible for death threats she had received for many years as a result of her environmental and human rights advocacy. Instead, police have focused on investigating Ms. Cáceres’ COPINH colleagues, who are themselves human rights defenders. Authorities have also reportedly altered the crime scene at Ms. Cáceres’ home. Mr. Gustavo Castro Soto, a Mexican human rights defender, was providing security accompaniment to Ms. Cáceres on the last day of her life. The sole witness to the murder, Gustavo Castro Soto was also injured during the gunmens’ attack. Instead of being treated as a victim of an attempted murder, Gustavo Castro Soto was held in police custody for three days during which time authorities reportedly failed to provide him with medical treatment, refused to allow him to change out of his bloodied clothing and deprived him of sleep during questioning. Fully cooperating with authorities, Gustavo Castro Soto provided extensive testimony to police. Although Honduran authorities now acknowledge he is not a suspect, they have refused to allow him to return to Mexico, over protestations of the Ambassador of Mexico to Honduras. On 5 March 2016, the IACHR found that Gustavo Castro Soto, as well as Ms. Cáceres’ family members and COPINH colleagues, are at serious risk, and granted precautionary measures to them, directing Honduras to take all necessary measures to ensure Gustavo Castro Soto’s security during the process of his preparing to leave and leaving Honduras. We urge your government to allow him to return to Mexico as soon as possible and to respect his rights to due process and consular protection. The appalling murder of Berta Cáceres starkly highlights the continuing failure of Honduras to respond effectively to the alarmingly high murder rate affecting all sectors of Honduran society, including journalists, lawyers and other human rights defenders. Honduras is considered the most dangerous country in the world for environmental activists. Between 2010 and 2015, at least 109 environmental activists were murdered, 40% of whom were indigenous. According to the Honduras National Commissioner of Human Rights – Ombudsman (CONADEH), within a population of 18,000 lawyers in Honduras, there were at least 89 violent deaths of legal professionals between 2010 and March 2015, and in approximately 82% of these cases, investigations were ineffective or perpetrators were not held accountable. The Honduran criminal law system fosters impunity through its notorious corruption and woeful lack of adequate resources for police and court services, in comparison with resources allocated to security and military sectors. Honduras is perceived to be one of the most corrupt countries in the region. The insufficiency and instability of funding of the judicial branch is a factor that threatens its institutional independence and its ability to perform the functions of protecting and guaranteeing the right of access to justice. Honduras has ratified the International Convention on Civil and Political Rights (ICCPR) and the American Convention on Human Rights (ACHR) and is a member of the United Nations and the Organization of American States. The ACHR (article 4) and the ICCPR (article 6) guarantee the right to life and impose on Honduras the legal obligation to prevent and remedy violations. Honduras and other state parties to these treaties must respond to a murder by conducting “serous and effective investigations” to ensure accountability and prevent impunity. What constitutes a proper investigation is specified in the UN Principles on the Effective Prevention and Investigation of Extra-Legal, Arbitrary and Summary Executions. LRWC agrees with demands by Ms. Cáceres’ family members for an investigation by an impartial international commission formed by the IACHR, international human rights organizations and appropriate governmental bodies. The assassination of Ms. Berta Cáceres while under precautionary measures, the murders of other environmental activists and the almost total impunity for homicides in Honduras demonstrates a pattern of serious and systematic failure by Honduras to prevent, investigate and ensure effective remedies for violations of internationally protected rights, particularly the right to life. LRWC strongly urges the government of Honduras to cooperate fully with the IACHR, all United Nations (UN) human rights bodies and Human Rights Council (HRC) mandate holders and implement in law and practice the UN Declaration on Human Rights Defenders in accordance with suggestions in the recent report to the UN HRC of the UN Special Rapporteur on the situation of human rights defenders. We also urge your government to implement the recommendations of the IACHR in its 2015 report on the Situation of Human Rights in Honduras including its recommendations on citizen security and the administration of justice. call for an investigation of the murder by an impartial international commission formed by the IACHR, international human rights organizations and appropriate governmental bodies. Law for the Protection of Human Rights Defenders, Journalists, Social Communicators and Legal Practitioners’, Decree No 34-2015, cited by International Service for Human Rights, 31 July 2015, http://www.ishr.ch/news/honduras-ensure-effective-implementation-human-rights-defender-protection-law#sthash.joEovvX3.dpuf. For comments on this law, see Protection International and CEJIL, Observations to the Law for the Protection of Human Rights Defenders, Journalists, Social Communicators and Legal Practitioners, ISHR, http://www.ishr.ch/sites/default/files/article/files/analisis-ley-de-proteccion-para-defensores-as_translated_final.pdf. Amnesty International, “Honduras: Deep failures in investigation into activist’s killing put many at risk,” 8 March 2016, https://www.amnesty.org/en/latest/news/2016/03/honduras-deep-failures-in-investigation-into-activist-s-killing-put-many-at-risk/. 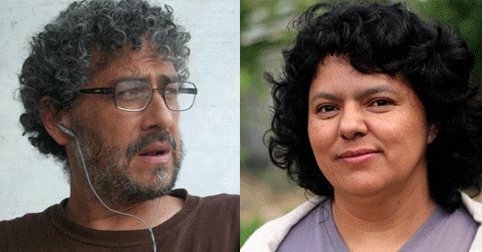 Gustavo Castro Soto, “Mexicano dice que escenario del crimen de Berta Cáceres fue modificado,” open letter, La Prensa, 7 March 2016, http://www.laprensa.hn/honduras/937438-410/mexicano-dice-que-escenario-del-crimen-de-berta-c%C3%A1ceres-fue-modificado. Also see the letter in La Tribuna, 8 March 2016, http://www.latribuna.hn/2016/03/08/vi-morir-berta-mis-brazos-la-conmovedora-carta-del-mexicano-gustavo-castro/. Inter-American Commission for Human Rights, Precautionary Measures, PM 112/16 – Members of COPINH, Berta Cáceres’ relatives and other, Honduras, 5 March 2016, http://www.oas.org/es/cidh/decisiones/pdf/2016/MC112-16-Es.pdf, summary in English at http://www.oas.org/en/iachr/decisions/precautionary.asp. Kane, Corey, “Honduras: The most deadly place for journalists in the Americas,” Latin Correspondent, 5 November 2015, http://latincorrespondent.com/2015/11/honduras-the-most-deadly-place-for-journalists-in-the-americas/. Between 2010 and November 2015, 28 journalists were murdered in Honduras. Organization of American States, “Office of the Special Rapporteur calls for an end to the impunity for crimes against journalists,” 2 November 2015, http://www.oas.org/en/iachr/expression/showarticle.asp?artID=1006&lID=1. Global Witness, “Global Witness releases new data on the murder rate of environmental and land activists in Honduras, the highest in the world,” 4 March 2016, https://www.globalwitness.org/en-gb/press-releases/global-witness-releases-new-data-murder-rate-environmental-and-land-activists-honduras-highest-world/?gclid=CJ2uy9uCt8sCFciFfgodN0oIAQ; Global Witness, How many more?, 20 April 2015, https://www.globalwitness.org/en/campaigns/environmental-activists/how-many-more/. Alianza por la Paz y la Justicia – APJ, “APJ demanda distribución equitativa del presupuesto del Sistema de Seguridad y Justicia,” 6 May 2015, http://alianzapazyjusticia.com/index.php/noticiasapj/item/211-apj-demanda-distribucion-equitativa-del-presupuesto-del-sistema-de-seguridad-y-justicia.html, citing its report, Alianza por la Paz y la Justicia – APJ. Presupuesto Histórico – Sistema de Seguridad y Justicia, 2006 – 2015. Inter-American Commission for Human Rights, Guarantees for the independence of justice operators: towards strengthening access to justice and the rule of law in the Americas, OEA/Ser.L/V/II. Doc. 44, 5 December 2013, paragraphs 49 and 55, https://www.oas.org/es/cidh/defensores/docs/pdf/Justice-Operators-2013.pdf. UN General Assembly, International Covenant on Civil and Political Rights, 16 December 1966, United Nations, Treaty Series, vol. 999, p. 171, http://www.refworld.org/docid/3ae6b3aa0.html. United Nations, Principles on the Effective Prevention and Investigation of Extra-legal, Arbitrary and Summary Executions, 24 May 1989, http://www.refworld.org/docid/3ae6b39128.html. Report of the Special Rapporteur on the situation of human rights defenders, Good practices in the protection of human rights defenders, A/HRC/31/55, 1 February 2016, para 51, http://www.ohchr.org/Documents/Issues/Defenders/A-HRC-31-55_en.pdf. Inter-American Commission on Human Rights, Country Report Honduras: Situation of Human Rights in Honduras, OEA/Ser.L/V/II. Doc. 42/15, 31 December 2015 http://www.oas.org/en/iachr/reports/pdfs/Honduras-en-2015.pdf.